Looking for an alternative to Teamwork? Teamwork is a project management tool designed to help professionals better track their projects from planning to completion. While the program’s homepage offers several interesting features, the software is primarily useful for managing task lists using the Kanban methodology or Gantt charts. This makes Teamwork quite limited, leading users to seek alternative solutions. Projects within Teamwork must be listed one stage at a time, which mistakenly assumes that two parts of the same project cannot be worked on simultaneously. A task also cannot be listed under two separate phases; for example, it cannot be listed as undergoing both the design phase and the development phase at the same time. 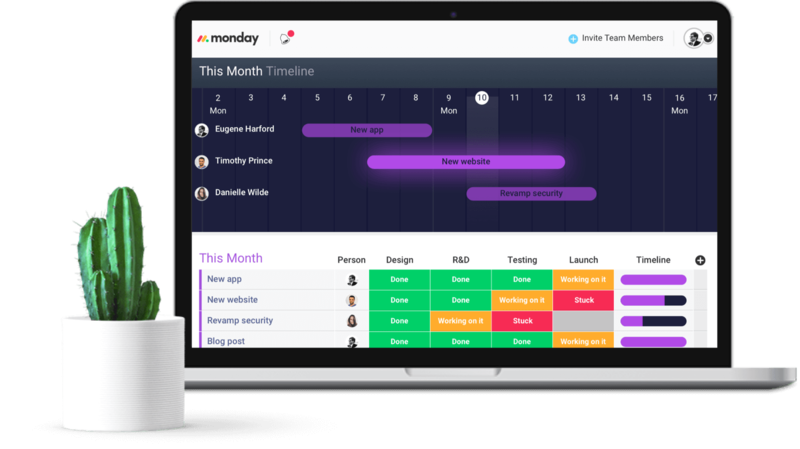 Because of these restrictions, more and more project managers are looking for a more flexible and convenient management solutions like monday.com. With monday.com, collaboration and organization has never been easier. Our clean interface allows you to keep track of the progress of your tasks and visually recognize the trouble spots. It is a project management tool that your team will actually enjoy using. Currently managing your work on Teamwork? You can easily switch to monday.com in 2 simply steps. First, export your data from Teamwork to Excel, then use our in-built Excel import integration to import the data to boards in monday.com!